First constructed in 1536, then expanded in 1657, this triangular fortress atop a hill was named after King Philip IV of Spain. 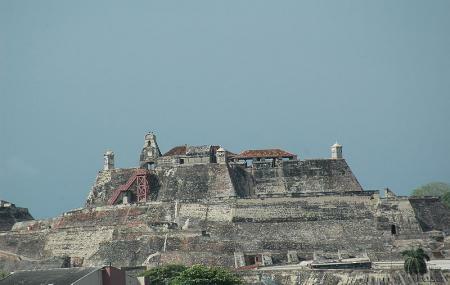 Cartagena Governor Don Francisco de Murga had it constructed to prevent enemies from attacking from behind the city. In the 1741 Battle of Cartagena de Indias, it held off British Admiral Vernon’s invading forces of 23,000 men and nearly 200 hundred ships! It also played an important role during the Spanish-American war of independence. The fortress is grand and intimidating to look at. Rising 41 meters into the sky, with batteries and parapets that reinforce each other's defences, and with a maze of tunnels inside, it has never been taken. For the best experience, make sure to rent the audio guide from the ticket office. Right outside the castle entrance is a pretty looking square. Rising in the middle you’ll find a monument statue of Spanish admiral Blas de Lezo y Olavarrieta. Lame, one-armed, and one-eyed, he fought in the the Battle of Cartagena de Indias, and is thought to have been one of the finest strategists in the Royal Spanish Navy. Parking at Avenida Antonio Arévalo and near the "Old Boots” monument on Calle 31. There is no shade at the Fortress. Try to avoid visiting in the middle of the day. This place is very nice. I would recommend visiting here. It's full of history and pretty fun for the family. There is also a little store to buy water, ice pops and other stuff when you reach the top. Though my favorite part is when you reach the top the breeze is amazing. So, the good part is done on to the cons. Make sure you wear good shoes it's allot of walking on an incline. You also should be aware of the amount of people at the entrance trying to see you hats and water. There's allot. There's so much solicitation i was getting very annoyed. But if that's fine with you. Go ahead the place is great. Very cool castle/fort Worth checking out. We arrived early in the morning to beat the heat. This turned out of be a great idea, the only shade is in the caverns of the fort. You will likely be bombarded by aggressive vendors upon arrival. You may want to buy a water or two. The fort is very cool with nice views of the city. We opted to not take the tour as we speak English and had our 3 yr old son with us. The tour would likely be worth it and offer more insights for history buffs. My son enjoyed the cannons. Decided to go here on a whim and was very impressed. Cartegena is known for its beaches and the Old City, but this is a very good piece of history to give the island some historic background. Not to mention the views from the top are outstanding. Very interesting to see the point of view of history from a different country. I recommend checking this out. It'll give you a better perspective of this tourist town. What a great place to visit. You can do audio tours, with a guide or just roam the place on your own. The views of the city from the top area are amazing. During sunny days it can feel really warm so be prepared!. I highly recommend it!